DETAILS: "Villa Sienna" is a beautiful, coastal home nestled in a private gated community in Seagrove Beach. 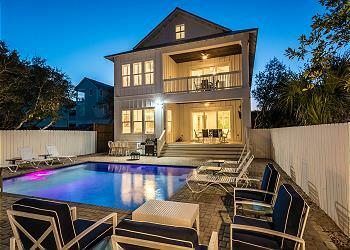 This six bedroom, three story home has been newly renovated and is the perfect home for making vacation memories. This fabulous abode boasts dazzling Gulf views from throughout the home with a walkway leading to the beach. The main living space is located on the second floor and features an open concept kitchen, living and dining room. Enjoy cooking in the gourmet kitchen while entertaining family and friends. With accomodations for 19, this home has ample room for the whole family! Splash into the private pool for hours of fun in the sun or take the path down to the Gulf of Mexico. Make this home your home away from home and book it today! We had a blast! The house was beautiful and very accommodating for our very large group. My only complaint would be the pool. It was dirty and the trees covered it so no sun on the pool. My husband and I came down in January to scout out a place for our family and their spouses as well as grandchildren. We feel that the service provided exceeded our expectations! All we asked for was available when requested. Chairs, bikes, and child carriers were all set up and waiting for us. The house was fantastic and allowed our families to have there own space. The walk to the beach was so nice as we had young grandchildren. The icing on the cake was the photographer you recommended (Kaylie B. Poplin) to capture this time for us was so accommodating and the pictures turned out so good! We had an issue with the dryer, and once reported, it was corrected wIthin hours. We would recommend this to others! We could not be more thrilled that you enjoyed your time with us in Seagrove and your experience with 360 Blue! We agree that this home is a wonderful option for a fun and relaxing vacation! We look forward to seeing you all again soon! We stayed with three families and had plenty of room. The house is even nicer than it appears in the pictures. The walk to the beach was very easy even with small children. There were two dishwashers and an ice maker. Everything worked well. The beds were super comfy. The outdoor decks were very nice with great views. The outdoor grill and pool were nice. The beach was not very crowded and you get 4 beach chairs and 2 umbrellas with the rental. We would definitely go back!! We are so delighted to hear how much you and your family enjoyed your vacation with us in Seagrove Beach! This home is perfect for large groups and has amazing accommodations for all! We look forward to hosting you and your group again soon! We are so glad to hear how much you enjoyed your vacation with us in Seagrove Beach! We agree that this home is the perfect place to spend relaxing and soaking up some sun! We hope to see you and your group again soon! We loved the house. Fit our family of 18 perfectly. Well equipped kitchen and a TV for everyone. Great view from the deck. Thank you for sharing your home with us. We are so glad you enjoyed your stay! We agree this home is perfect for large families. It is our pleasure to have you and we hope to again very soon! Really nice place to stay at such a beautiful beach. Very clean house, awesome bedrooms, kitchen has everything for our group of 17 people, loved the ocean view balcony, and the beach is 30 seconds of walking distance. The water looks absolutely perfect! We are thrilled that you enjoyed your stay in this beautiful home. It is truly the best place for a relaxing beach getaway. We loved having you with us and hope to see you back soon! This house was perfect for 10 adults and 4 young children. It was cozy and inviting and had amazing views. The proximity to the beach as well as to Seaside, watercolor and Rosemary Beach was wonderful. The pool heater didn't work when we were there but we spent our time at the beach. I will say that the main master bedroom on the third floor didn't get nearly as cool as the rest of the house so it might be pretty uncomfortable in the warmer months. All in all though we loved this house and its location. We would definitely return! Such a beautiful photo! We are thrilled that you enjoyed this beautiful home. We are checking into the AC to be sure that it is working correctly and the pool heater has been repaired. Thank you for choosing 360 Blue, we hope to see you back soon! We LOVED this place with our big group of 18. 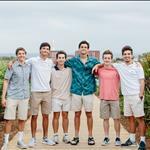 With 12 kids from ages 6-18, the close walk to the beach, the indoor basketball court, the private pool, and the separate TV room for movies and gaming provided plenty of entertainment for them for the whole week. The beds were comfortable, the kitchen was well-equipped (even a separate ice maker! ), and the giant dining table was the perfect size for all of us whether we were eating or playing games. Our 3 families have stayed in several homes together over the last 5 years, and this one is by far the BEST. The quieter location and smaller crowds on the beach made our annual vacation so relaxing. Plans are already in the works to stay here again next year! What a fun family photo! We are elated to hear that you loved your stay with us! We understand how important it is to have plenty of entertainment for the kids staying with us so we're happy to hear they could take advantage of the basketball court and gaming area! Thank you so much for choosing 360 Blue for your group's beach vacation. We look forward to helping you plan your next visit with us! Thank you for staying with 360 Blue! We are so excited that you and family had such a great stay in Seagrove! That home is in the perfect location and the kitchen is phenomenal! Thank you again and be sure to come back and visit us again soon! This beautiful home was perfect for our stay. The view of the gulf from the deck is stunning and was perfect for my morning coffee. The boardwalk was just steps outside the backdoor and an easy stroll to the beach. Loved the privacy. Very spacious home with beautiful decor. Equipped with everything we needed. Location is perfect. Would definitely stay here again and recommend to our friends and family. We are so thrilled you enjoyed your vacation so much! Thank you for staying with 360 Blue and we hope to have you back again soon!